When the German director Doris Dörrie attended the Morelia International Film Festival in 2010 with her narrative feature “The Hairdresser,” she wandered around for the duration of the festival in Michoacán, México wondering why she seemed to be the only out-of-towner there. Such vocal strength is likely required of del Carmen to break through as part of just the second generation of women in the country to enter a profession primarily dominated by men, yet while “Que Caramba es la Vida” can be seen as the story of the fight for progress in one of Mexico’s oldest traditions, it also is a celebration of the nation’s rich cultural history. Shortly after the film made its debut at SXSW earlier this month, Dörrie spoke about how she believes her presence as “an alien” in Mexican culture actually brought her closer to her subjects, how the rise of female mariachis and Mexico’s national fascination with death intersect, and why there’s far more to the country than the drug war. How did you first approach this subject? Since 2010, I spent two months each year in Mexico City, and tried to find out how much people there are affected by the drug war and I found that the only association we have in Europe when we hear “Mexico” is “drug war,” but life in Mexico is very different in many, many aspects and I really wanted to tell a story of women there who juggle everyday life and have something that they feel passionate about, like music since this is something that I can identify with. At the same time, I think you get a pretty good idea of what it’s like to be living your life in Mexico City where their life is being affected once and awhile by the drug war, but not entirely. That led me to a young women’s band, Las Estrellas de Jalisco, which is in the film, then I happened to come across the older ladies [in Las Pioneras de Mexico], who are the very first Mariachi band in 1958. Was it really as easy as just going to Garibaldi Plaza where these women play in the film and discovering them? I made it that easy. A lot of people warned me that it was going to be dangerous and that I shouldn’t be going there all the time, but I did. I just went for six weeks straight every day and I’d spend 12 to 14 hours on Plaza Garibaldi. People thought it was pretty weird, you know — this blond, tall German sitting there every day. I had a little chair with me and I just sat down, looked around and met and talked to everybody, which happens to be my favorite pastime. It’s not something that you really do in Mexico City much. You don’t go to the Plaza Garibaldi that much really anymore but to me, it was not all that strange, really, because it reminded me very much of the Oktoberfest in Munich. Lots of people, lots of music, crazy people, drunks, all kinds of people. The whole vitality of it felt very close to home. 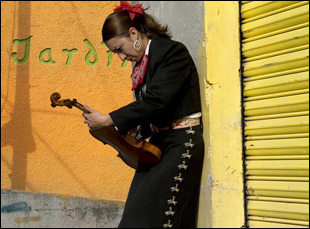 That actually touches on what was one of the most interesting ideas of the movie for me, which is how here are these women doing something progressive by performing music that has been traditionally done by men for centuries and yet the tradition itself in such places as the Plaza Garibaldi seem to be fading away. Was that dichotomy particularly striking to you? Yes, it’s strange when these women are singing these Mariachi songs because they’re all very male songs. It gives the whole thing some really interesting aspects because you can sense the machismo, the chauvinism of Mexico through the lyrics of the songs and see how the [women are] dealing with this very macho culture and how difficult it still is to be playing music as a woman in Mexico. Did this actually unfold the way that you more or less experienced it? It’s a difficult question. I have several things that I knew upfront that I really wanted to have in the film. 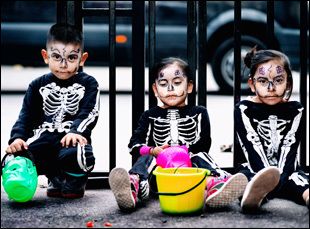 I wanted to have my favorite song [from shooting] “Un Puño De Tierra” and to address the theme of death and dying and Dia de los Muertos, because it’s such a woman’s theme. Women take care, until this day, of the dead and dying, and of the sick. Women are affected by the drug war in that way too, of course, where the men are being taken away from them because they get shot. 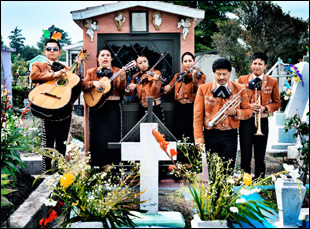 Death is very much a women’s topic, so I found it always very, very touching to see the Mariachi bands play at the graveyards. The song “Un Puño De Tierra” became almost like a storyline being picked up again and again and again, so I used it as a red thread through the film. Was it interesting to meet the younger generation of mariachis before the older one to introduce you into that world? Yes, because the older ones later on blamed the younger ones for being mas metallico, more interested in money, and using the music as a way to relax, which, to a certain extent, is true. When you listen to the young women who say, “Well yeah, here we lead a different life when we play music. We’re much freer, and this is where we can be who we really are,” which I find a fair reason for doing what they’re doing. You would think that the life would have changed a great deal between these two generations, but then it really hasn’t. Their life isn’t very much different from the older ones. It’s amazing to me that they go to Garibaldi Plaza rain or shine. Yes, but you know what’s really lacking is the tourists in general. There are no tourists in Mexico City. In the six weeks that I sat on the bus, riding every day, not once did I see a European tourist group and very, very rarely, Americans. They don’t spend any time on the Plaza because they’re being told that the Plaza is too dangerous, so they go into the bars and that’s where they spend the money, but they rarely pay for a Mariachi group outside. It’s mainly Mexicans, but the business is really bad without tourists. It was always a tourist spot, and they’re just not coming anymore. Besides the lack of tourists, was there something particularly surprising about the experience? It was surprising that I got accepted so quickly, maybe because I’m such an outsider. My cameraman and my sound man happen to be tall and blond like me and together we were these three blond Germans. We really were aliens in the Plaza, but we didn’t fit into any stereotype from the Mexican side. As a European, I’m not a gringo, I’m not Mexican, they really didn’t know what to do with me, so I was very, very free that way to ask very, very stupid, very basic questions that an American or a Mexican probably would never ask. Has it been nice to reunite with the women at the premiere at SXSW? It’s nice when you have the feeling like there’s no time lapse, really. You can just pick up where you left off, and that’s what’s happening with the ladies and me. We saw each other yesterday at the airport and we just hugged and were happy to see each other, as if no time had passed at all and it’s very uplifting for [the women] to be invited over here and to be playing here in Austin. It’s one thing that I never really realized before that much, that this is really the land of milk and honey when you look at it from Mexican side. “Que Caramba Es La Vida” does not yet have U.S. distribution. Revealing "Hide Your Smiling Faces"
Interview: Anja Marquardt & Marc Menchaca on Taking Command of "She's Lost Control"